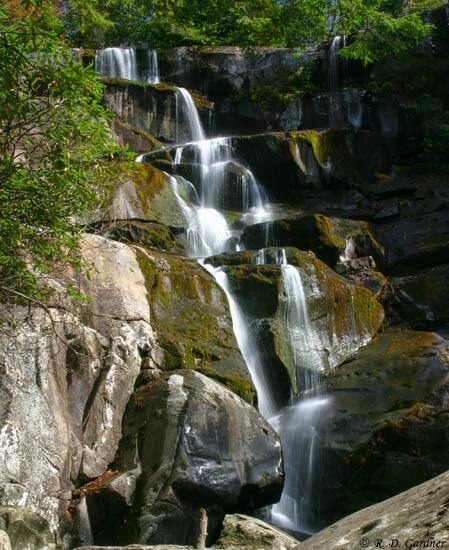 This waterfall (often misspelled as Ramsey Cascade, even on the official national park website) is considered by some to be the best waterfall in the Smoky Mountain National Park. I can't comment on that since I haven't been to all of them, but I can say that it is a great hike and at the very least a very good waterfall. 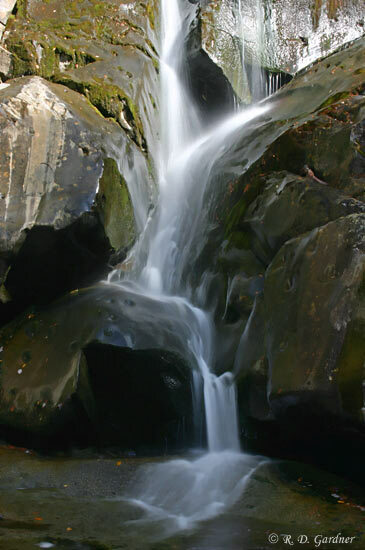 As the name implies the falls is actually a series of cascades that drop a total of 65 feet. At the bottom, Ramsay Prong levels out, flowing over the smooth bedrock for 100 feet or so before dropping another 15 feet and continuing down the mountain. All of my pictures were taken above the 15' drop as I had to stay close to my boys and well, to be honest, I forgot to go down there. There is a massive boulder as you approach the cascade that is perfect for relaxing and eating lunch while soaking in the beautiful scene. Does it get any better than this? Not much. Ramsay Cascades can be found in the Greenbrier area off of U.S. 321. From Gatlinburg you will drive east for about 6 miles and turn right on Greenbrier Rd. Follow this road (turns to gravel) back into the hills, past the picnic area, hugging the side of the mountain, and take a left on Ramsay Prong Rd which quickly crosses a bridge. Continue about 1.5 miles to the parking area at the end of the road. The morning we were there, we saw several wild turkey on Ramsay Prong Rd. The trail is at the back of the parking area. This hike is not for the faint of heart. Literally. But then again my 5 year-old did it. To be fair, though, I never doubted his ability because he's one of those "bundles of energy" types. 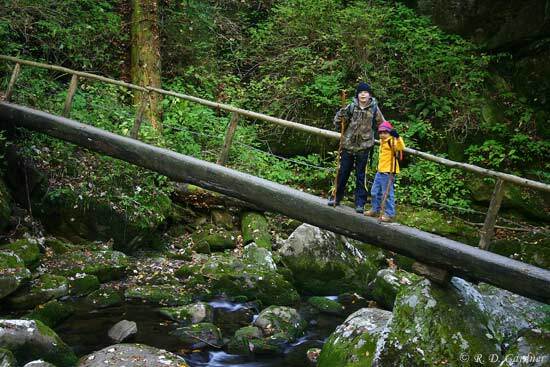 The trail begins by crossing the Middle Prong on a long, wooden footbridge. For the first 1.5 miles, the trail is an old logging or access road that is broad and easy to walk - well, except it's uphill of course. After 1.5 miles, it looks like the trail forks. It doesn't. It's just a circle where there used to be a turnabout. On the back side of the circle will be a sign and the continuing trail. The scenery from here on just gets better. Your travels will take you through some very old forests with trees of record and near-record proportions. You will also get to enjoy a couple of creek crossings courtesy of log bridges. I've included a picture of one crossing on the left. The trail will get steep and rocky towards the end but don't despair. The reward is worth the effort. 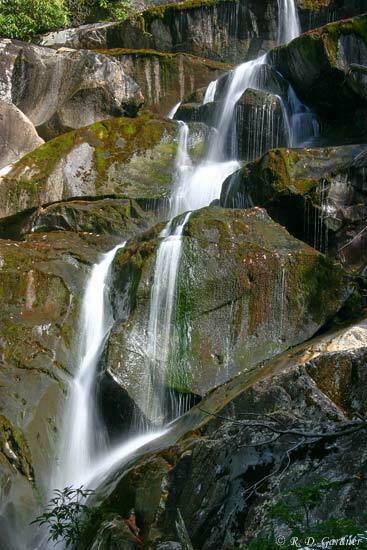 FREE TIP: There are reports of another cascade above Ramsay Cascades that is almost as large. I didn't know of it at the time. 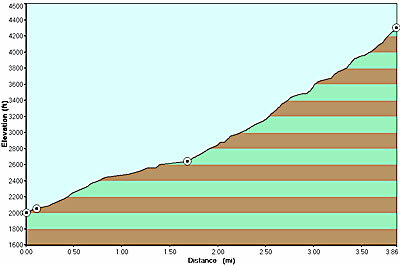 Look for an unmarked trail that leads on up the mountain. It's supposed to be about 1 mile past the main cascades. Good luck. I got to Ramsay Cascades too late. I was unable to get the long shutter speeds that I would normally prefer for this type of waterfall due to the direct sunlight. Because of the hike length, though, your choices are limited. Your best bet is to go to the cascades on an overcast day and/or wait for a passing cloud. Of course I had a beautiful, cloudless sky. A polarizing filter is vital for good pictures here to reduce the glare on the dark rocks. And as always, a tripod is a must. Try some tight compositions with only parts of the cascades. The shot above was taken directly on the trail as you approach the waterfall, and the other photos were taken on the right side of the stream. A wide angle lens will be your friend here, but you might want to try a longer lens if playing around with tight compositions. The water flow was low so I had no problems crossing the creek right below the main cascades. Under high flow conditions it may be tricky as the rocks are slick.